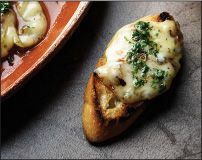 Provoleta is a melted-cheese appetizer served in Argentina before a feast of grilled meats, but “it makes a great snack with drinks, no matter what you serve afterward,” said David Tanis in The New York Times. Buy some provolone and have it cut into 1-inch slabs. You should set the cheese out and let it dry for several hours before seasoning and cooking it. It should be served on toasted bread with dabs of chimichurri. • An hour before cooking, prepare chimichurri: In a bowl, stir together parsley, oregano, garlic, olive oil, salt and pepper to taste, a large pinch crushed red pepper, vinegar, and water. Mixture should be pourable; add water if needed. Set aside to let flavors meld. • Place a cast-iron pan over medium-high heat. When pan is hot, add sliced cheese. Sprinkle with half the oregano and ¼ tsp red pepper. Cook until cheese begins to brown on the bottom, about 2 minutes. Flip with a spatula and cook 2 to 3 minutes more, until second side is browned and cheese begins to ooze.